Nottingham City Council has awarded Galliford Try the contract to rebuild the Broadmarsh car park and bus station. The firm beat rivals Bowmer & Kirkland and G F Tomlinson with a £43m bid. 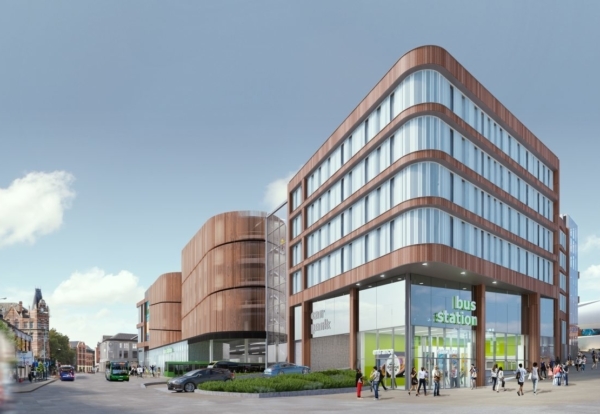 The new car park and bus station development will include a 1,378 space car park, and shops on Carrington Street and Collin Street. It will be clad in terracotta tile and glass, a radical change from its concrete predecessor. The project forms part of the wider Broadmarsh shopping centre redevelopment being constructed by Sir Robert McAlpine. The replacement scheme will include a smarter car park, bus station, space for shops and flats on the Carrington Street elevation.